Never been to a B&B before? Click here to learn more about the B&B experience. Woodland Trails Bed and Breakfast—A Nice Place to Stay, With Something to Do. 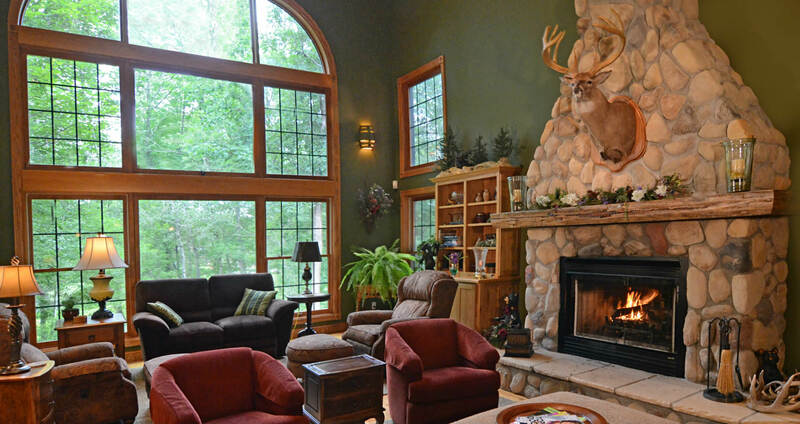 Completed in 2003, Woodland Trails Bed and Breakfast near Hinckley, Minnesota was built to be a country inn with your comfort in mind. The building has all the modern construction elements, like sound-proofing, spacious guest rooms and fine common areas for guests’ use. Located on the Wisconsin border between Hinckley, Minnesota & Danbury, Wisconsin, our inn is less than two hours from the Twin Cities, St. Cloud and Eau Claire, WI and just over an hour from Duluth/Superior. In the B&B: Great Room with wood-burning fireplace; Entertainment Room with big-screen TV and English billiard table. Out the windows: Birds, deer & other Minnesota wildlife. Grace Lake Too: Enjoy canoeing and paddle boating on our private pond. On the land: 500 acres of woodland with miles of private trails for hiking, cross-country skiing (bring yours) or snowshoeing (use ours). From May through October enjoy complimentary golf carts. A Treasure Hunt game inside the B&B and a Geocaching challenge outdoors on the trails. A gazebo and deck overlooking the pond with a campfire that is ready to go. In the area: Shopping, hiking, biking, canoeing, cross-country skiing, snowmobiling, four-wheeling opportunities nearby. Casinos: Grand Casino in Hinckley and St. Croix Casino, Danbury, just four miles from Woodland Trails Bed and Breakfast. Ladies, have no fear! Your man will enjoy the inn as much as you because of the rustic atmosphere and things to do. John and Sandra O’Reilly spent their working careers operating Plunkett’s Pest Control, a regional pest control service company based in the Twin Cities. When their daughter, Stacy, assumed leadership of the company in 2003, John and Sandra started their second career, as innkeepers at their newly built bed and breakfast. Located on 500 acres of Pine County woodland they have owned since the 1980s, the O’Reilly’s see the B&B as a way to meet and share their land with interesting people. Many of the guests coming to Woodland Trails Bed and Breakfast have never been to a B&B before. 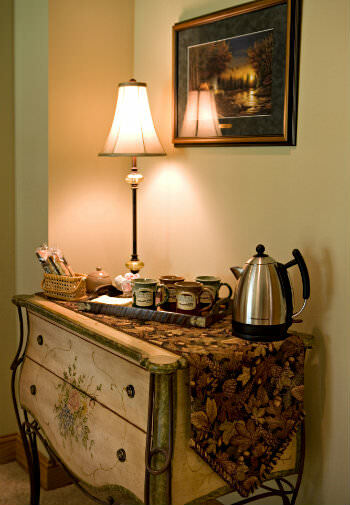 “Welcoming” is the first impression many guests get as they arrive at Woodland Trails Bed and Breakfast. Everything about the house and grounds is made to help make you feel welcome, at home and comfortable. Your experience at our B&B begins with innkeepers Sandra and John. One or both will greet you when you arrive. They’ll show you the Great Room, the Dining Room and the lower-level Entertainment Room, all for your use. John & Sandra have their own spaces in the house so, when you are enjoying the common areas, you will not be interrupting any family activities. When they show you to your room, you’ll find a list of other guests in the house whom you’ll get to know and enjoy during your stay. Many new friendships have been made among people who met for the first time at our inn. For private time together, your room has a comfortable sitting area with fireplace plus a private deck or patio. DirectTV plus DVD and CD players are there for your relaxing enjoyment. A whirlpool tub offers more relaxation. Newly built to be a B&B, Woodland Trails Bed and Breakfast has a geothermal system to keep you toasty warm in winter and comfortably cool in summer. Soundproofing insulation in floors and walls ensures privacy. You will find your room outfitted with upgraded furnishings and spotlessly clean. Guest refrigerators contain complimentary soft drinks, bottled water and wine. Keurig Coffee Makers can be used to make coffee, tea or hot chocolate. In the dining room, a microwave and popcorn make for an anytime snack. A full, three-course breakfast is included and part of the experience of a B&B. 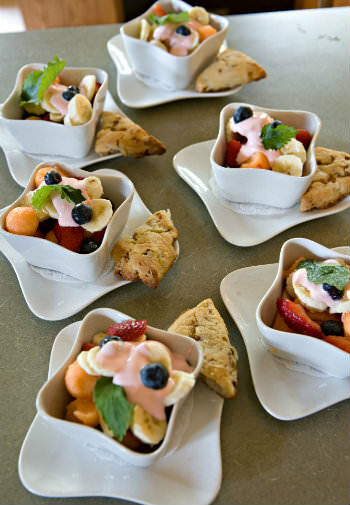 Our breakfasts consist of a fruit course, a main course and, something new for many guests, a dessert course. John & Sandra serve as hosts and ensure that guests are introduced to others with common interests. With breakfast served at 9 a.m., guests often linger, enjoying each others’ company, until after 11 a.m. It is a social event! Relaxing in the B&B, including enjoying the luxury of a nap after breakfast. Enjoying a stroll around the pond or, during the summer, paddle boating or canoeing. In winter, snowshoes are available for your use. Taking a day trip to Siren, Duluth / Superior or Hayward, Sandra’s favorite shopping town. As you leave, you may utter the refrain we hear most often: We’ll be back! It is gratifying that nearly half of the guests at Woodland Trails Bed and Breakfast have been here before, some more than dozen times!